The treatment, research and volunteer work for cleft lip and/or palate (CL/P) has been led for over 30 years by our team. Within this period, more than 4,000 cases of CL/P were treated and at the same time, and approximately 400 papers were published as the first or partner researcher in Nature Genetics, New England Journal of Medicine and others. In addition, with $20 million that was donated from companies and laypeople, and the grant from the Japanese government, CL/P centres in many countries and in Japan, the oral and craniofacial congenital anomaly gene bank in our CL/P centre was established by our leadership. In the bank there are genes from approximately more than 8,000 cases. The genes were mapped with Professor Jeffery Murray of Iowa University in the United States, the findings about genetic syndromes such as Van der Woude Syndrome and basal cell nevus syndrome were applied in clinical settings. The genetic counselling section that specialises in the oral and maxillofacial field was established by our effort for the first time in Japan. In this review, our clinical experience and approach for genetic diagnoses and prevention of cleft lip and/or palate will be discussed. Objective: To compare the mesiodistal root angulation of panoramic images generated from traditional panoramic tomography or cone-beam computed tomography (CBCT). Methods: CBCT scans and panoramic radiographs of 20 patients were collected. The Invivo- Dental 5.0 was separately applied for maxillary or mandibular panoramic image generation. The generation method was assorted by two head positions, the Frankfort plane horizontal position (P1) and the occlusal plane horizontal position (P2), and three central plane settings (root apical plane, tooth centre plane and crown marginal plane). The amount of mesiodistal root angulation on panoramic images generated from CBCT (GPIs) deviated from that on the traditional panoramic images was calculated by paired sample test. The variation trends were explored with different head rotation and incisors' buccolingual root inclination. Results: By selecting the tooth centre plane, the GPIs were suggested to be generated by the Frankfort plane horizontal position for maxilla; while the occlusal plane horizontal position was advised for mandibular GPIs' generation. Moreover, the mesiodistal root angulations were demonstrated to regularly change along with variations of head rotation and the incisors' buccolingual root inclination. Conclusion: Panoramic images can be generated from CBCT by the standard operating procedures with proper head position and central plane setting. But cautions should be taken during the generation, bearing the variability of mesiodistal root angulation in mind. Objective: To compare different surface treatments of lithium disilicate-based ceramic on bond strengths to composite. Methods: Lithium disilicate-based ceramic microbars (1 mm × 1 mm × 6 mm) were produced and abraded using diamond (D) or CoJet sandblasting (C), etched using phosphoric acid (P) or hydrofluoric acid (H) and silanised (S). A total of 12 surface treatments were adopted: D, DP, DH, DS, DPS, DHS, C, CP, CH, CS, CPS and CHS. An adhesive resin (XP Bond) was then applied and a composite build-up was placed. All specimens were thermocycled 5,000 times and submitted to microtensile bond strength test (μTBS). Results were analysed using one-way analysis of variance and the Dunnett T3 test. Stereomicroscope and scanning electron microscopy were used to determine the failure modes. Results: Surface roughening, acid etching and silanisation all have a significant influence on the ceramic-composite bond durability. Groups DH (30.7 ± 6.5 MPa), DHS (32.0 ± 8.2 MPa), CH (27.2 ± 4.5 MPa) and CHS (29.2 ± 5.5 MPa) showed the highest μTBS statistically. Groups DS (11.5 ± 3.0 MPa) and DPS (9.7 ± 2.2 MPa) had higher μTBS than groups D (4.5 ± 2.9 MPa) and DP (5.2 ± 3.0 MPa), while groups C (1.7 ± 0.7 MPa), CS (1.7 ± 0.9 MPa), CP (1.7 ± 0.6 MPa) and CPS (1.7 ± 1.1 MPa) showed the lowest μTBS. Conclusion: Hydrofluoric acid etching was effective in improving the bond strength of composite to lithium disilicate-based ceramic, regardless of the method of surface roughening and silanisation. 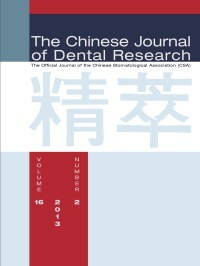 Objective: To determine the prevalence of occupational exposure (OE) occurring to dentists, dental nurses and senior dental students in a Chinese dental hospital and to assess associated factors with these exposures. Methods: Data were collected through anonymous questionnaires, which were distributed to dentists, nurses, and senior dental students. Results: All 205 dental personnel who voluntarily participated in the survey completed the questionnaire. Up to 71.2% of respondents experienced at least one OE to blood and body fluids (BBF) one year prior to this study. Dentists had a significantly higher incidence of OE than nurses (82.6% verse 60.8%), and a higher incidence of percutaneous injury than students (63.8% versus 41.7%). Sixty-seven percent of exposed dental personnel did not report the incidents and only 4.1% underwent postexposure blood tests. Although 97.6% of respondents wore gloves, more than half the subjects did not use protective goggles or masks during daily dental practice. Conclusion: There was a high level of OE and a significant incidence of underreporting among Chinese dental personnel, particularly in dentists. Inadequate use of personal protective equipment and ignorance about postexposure management were of great concern. Objective: To compare the penetration and adaptation of a moisture tolerant resin-based sealant with a conventional resin-based sealant in different occlusal fissure types in vitro by scanning electron microscopic (SEM) technique. Methods: Fifty sound, intact extracted premolars and third molars were included. They were randomly and equally allocated to receive either Seal-Rite (conventional resin-based sealant) or Embrace WetBond (moisture-tolerant resin-based sealant). Etching and sealant applications were performed as per manufacturers' instructions. Specimens were sectioned at the deepest part of the fissure and viewed under SEM. Under SEM, fissure types were classified as U, V, I, IK or inverted Y. SEM images were analysed using Biowizard image analysis software to measure penetration and adaptation. The data were statistically tested. Results: U fissures showed the highest mean percentage penetration. V forms exhibited the best adaptation. IK forms showed the poorest percentage penetration and adaptation. Fissure form significantly affected adaptation but not penetration. Embrace WetBond penetrated better than Seal-Rite into all the fissures but adapted excellently only in U fissures. Conclusion: Fissure morphology significantly affected sealant adaptation. Moisture-tolerant Embrace WetBond was better than conventional Seal-Rite in penetration and adaptation into fissures. Objective: To evaluate the effect of sodium fluoride rinse on sucrose-induced decrease in plaque pH with interdental plaque pH telemetry. Methods: Six participants wearing partial lower prostheses incorporating a miniature glass pH electrode were included. The measurement of plaque pH was performed after 6 days of plaque accumulation. Three experiments were performed to test the effects of fluoride administered before (experiment I) or 10 min after (experiment II) and 25 min after (experiment III) a sucrose rinse. In experiment I, the subjects rinsed with 0.05% NaF solution before rinsing with 10% sucrose to examine the effect of fluoride on the sucrose-induced pH drop. In experiment II, the subjects first rinsed with 10% sucrose and then followed no subsequent rinsing or rinsing with tap water 10 min after sucrose expectoration, or 0.05%, 0.02% or 0.01% NaF solution for 2 min. In experiment III, the subjects first rinsed with 10% sucrose and then 25 min after sucrose expectoration, they rinsed with 0.05% NaF for 2 min. The plaque pH was continuously recorded for about 120 min. Results: Without any subsequent rinses, the plaque pH decreased at 10 min to 4.36 and stayed below the critical pH 5.7 for about 85 min after the sucrose rinse. Subsequent water rinses showed little effect on the sucrose-induced decrease in plaque pH. Pretreatment of 0.05% NaF solution showed no effect on the subsequent sucrose-induced pH drop. Subsequent rinses with NaF solutions at 10 min after the sucrose rinse inhibited the sucrose-induced pH drop in a dose-dependent manner. Subsequent rinses with NaF solutions after the sucrose rinse also significantly reduced the time below pH 5.7 and the area of plaque pH curve under 5.7 (AUC5.7). Furthermore, the AUC5.7 value (3.99) of 0.05% NaF rinse at 10 min after the sucrose rinse was much smaller than that (57.01) of 0.05% NaF rinse at 25 min after the sucrose rinse. Conclusion: Rinsing with 0.05% fluoride after carbohydrate consumption effectively reduced the acidogenicity of the plaque and could enhance the anticaries functions of fluoride. Objective: To evaluate the effects of periodontal non-surgical therapy on serum levels of the inflammatory cytokines in chronic periodontitis subjects with stable coronary heart disease. Methods: Seventy-five subjects with both chronic periodontitis (CP) and stable coronary heart disease (CHD) were enrolled in the study. Forty subjects received periodontal nonsurgical treatment including oral hygiene instruction, scaling and root planing, whereas 35 subjects received oral hygiene instruction only. At baseline and 3 months after completion of periodontal treatment, clinical periodontal parameters were recorded. Serum levels of tumour necrosis factor-α (TNF-α), interleukin-6 (IL-6) and C-reactive protein (CRP), lipid profile markers and white blood cell count were assayed. Pearson's correlation analysis was applied to examine the correlation between the change of TNF-α, IL-6 and CRP levels and the change of periodontal parameters after non-surgical periodontal treatment. Results: At baseline, there were no statistical differences in all clinical, biochemical parameters and cytokine levels between these two groups. Three months later in the treatment group, all clinical parameters improved significantly and the serum levels of TNF-α, IL-6, and CRP reduced significantly. Reduction of TNF-α was significantly positively correlated with the reduction of bleeding index and plaque index; reduction of IL-6 was significantly positively correlated with the reduction of clinical attachment loss; reduction of CRP was significantly positively correlated with the reduction of clinical attachment loss and plaque index. Conclusion: Non-surgical periodontal therapy decreased serum TNF-α, IL-6 and CRP levels in CP subjects with stable CHD, which could help to reduce the inflammatory burden of stable coronary heart disease subjects. Objective: To determine the prevalence of preeruptive intracoronal dentin defects in Chinese children from panoramic radiographs, and describe the imaging characteristics of these lesions. Methods: A total of 707 panoramic radiographs with 8,171 unerupted permanent teeth were examined. Each unerupted tooth was examined with regard to the absence or presence of radiolucencies within the dentin of the crown. The location and size of the lesions were recorded. Also whether the lesion communicated with the pulp was noted. Results: The prevalence of intracoronal radiolucency in the subjects was 0.85%, and the tooth prevalence of the anomaly was 0.7%. Conclusion: Panoramic radiographs may help in detecting the preeruptive intracoronal defect. Lichen sclerosus et atrophicus (LSA), also called Lichen sclerosus (LS) is a chronic, benign, depigmenting disease of the skin and mucous membranes, most frequently affecting genital mucosa and skin. Involvement of the oral mucosa without concurrent genital or skin lesions has very rarely been reported in the literature. Here we report on two Chinese women with LSA limited to the dorsum of the tongue, and describe the clinical manifestations and histopathological findings of these two patients.